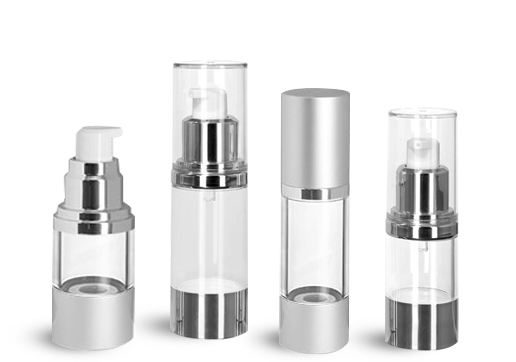 Clear AS airless bottles with airless pumps are accented with matte and polished aluminum in three convenient sizes. These stylish airless bottles can showcase a range of cosmetics, including foundation, revitalizing serums, and bronzers. These cosmetic bottles are compsed of AS which is 70 - 80% styrene and 20 - 30% acrylonitrile, for a plastic compound that has similar properties to polystyrene, but higher strength, stiffness and chemical resistance. The airless pumps are composed primarily of polypropylene, with LDPE and silicone inner parts for propellant-free dispensing. Select from our clear cosmetic airless bottles with silver or clear overcaps. The combination of crystal clear cylinders and silver bases gives these cosmetic bottles a high end appearance without the high end price. Transport foundations, bronzers, and other cosmetics easily and mess free in purses and travel make up kits by choosing these airless pump bottles with overcaps in 15 ml, 30 ml, and 50 ml sizes.